Lavender oil is produced from the flowers of the lavender plant (Lavandula latifolia). As an essential oil, lavender is a powerful fragrance with numerous uses. It is an effective and natural tool for the control of insects. Ants enter your home in search of food. They are attracted to certain odors, and repelled by others. 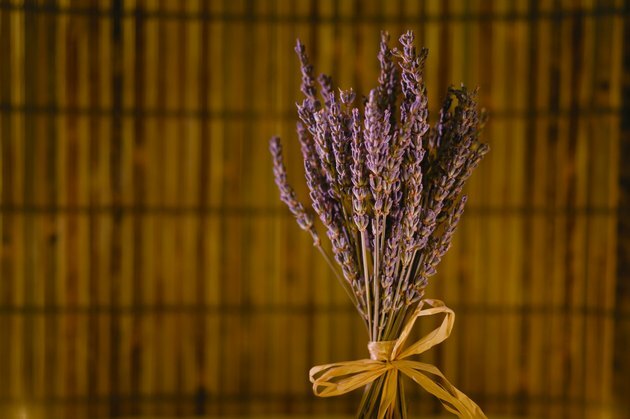 Lavender infuses your home with a scent that is unattractive to these pests. It can be used in a dried or liquid form. Ants avoid the scent of lavender. Lavender is an environmentally friendly measure to use in place of stronger, toxic substances for ant control. Its fragrance acts as a deterrent to ants without the overpowering odor from strong-scented repellents. Lavender is used in some natural insect repellents in place of poisonous substances such as DEET. In a diluted form, oil of lavender may be used directly on the skin to repel other insects as well. Leaves of dried lavender repel ants in the same way as oil. Dried lavender can be sprinkled in areas ants frequent, such as cupboards, corners in the kitchen, around windows or doors, or anywhere you have spied ants. If you prefer, use the oil by mixing one part lavender oil with 10 parts olive oil. Place the mixture in a small spray bottle and apply to ant paths. Lavender plants are grown easily in your garden to create a supply for multiple needs. Or, make a potted garden of lavender plants. Not only with the deep purple flowers enhance the appearance of your home, the plants will deter other insects. Later, the dried leaves can be used as ant repellent. Lavender is thought to calm the mind and reduce stress. It makes a beautiful addition to a home garden, while serving other purposes along the way. Ant control is an ongoing issue, so practice prevention. Continue to spray the areas ants frequent. A good rule of thumb is to spray or wipe ant paths with the essential oil every two to three days until ants are no longer seen. This erases the scent trail that ants create when they frequent your home. Also, soak cotton in lavender oil and place strategically around the areas of known ant invasion. The scent will linger, acting as a repellent even after you've finished spraying. Residing in upstate New York, Cathleen Anderson is a vegetarian freelancer who has been writing since 1994. She holds a bachelor's degree in psychology from State University of New York, Potsdam and a master's degree in counseling from SUNY, Oswego. Anderson is a licensed, nationally certified counselor who works in an emergency department focusing on the mental and physical health of her patients.